On the heels of the launch of Qualcomm’s latest processor, OnePlus CEO Pete Lau announced that its next flagship will be powered by the Qualcomm Snapdragon 855 Mobile Platform. The announcement was made at the Qualcomm Snapdragon Technology Summit 2018. The new processor is 5G capable and can handle data speeds 50 to 100 times faster higher than what the current platforms on 4G technology do. The chipset has many other features introduced for the first time for mobile applications. While Samsung was there to confirm that its next year’s release 5G phone will be fitted with the Qualcomm Snapdragon 855SoC on the first day, the second day belonged to OnePlus and according to Pete Lau, their OnePlus phone with 5G capability will be launched in the UK in association with EE, the mobile service provider in that country. This is also slated for the next year though the precise dates are yet to be announced. “OnePlus only makes flagship smartphones, and we believe that the Snapdragon 855 is the best and only choice. We are thrilled by its powerful performance and 5G capabilities. OnePlus will continue to bring its users the best technology and the best user experience possible,” Pete Lau said at the event. OnePlus has had a great run in the smartphone market with its OnePlus 6T flagship phone that it launched recently and most of its flagship devices sport the top end Snapdragon chipsets only. The company manages to sell its phones in 196 countries and counts over 5 million users worldwide. 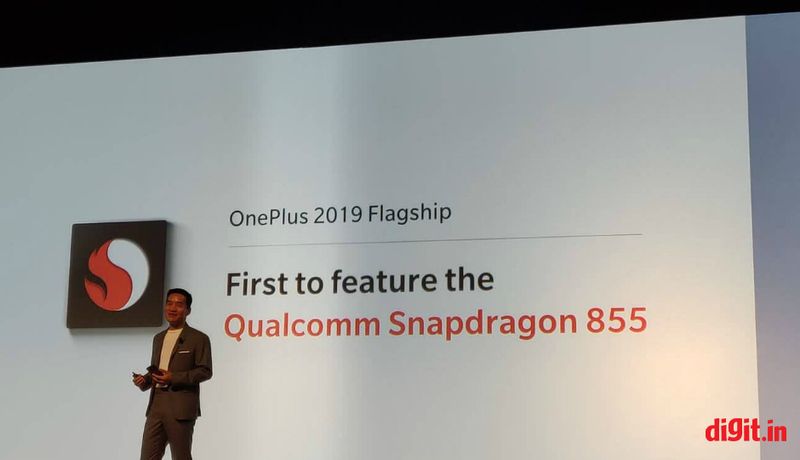 It is learned that OnePlus also worked in close collaboration with Qualcomm in developing this new 5G enabled chipset. The first quarter of the year ahead is going to be full of action with the 5G service expected to be rolled out, at least in the developed markets like the US, the UK, and Europe. Now that the processor maker has made the details public, one may start hearing the hardware manufacturer’s line up their 5G devices. Samsung is reported to be making its top end phone the Samsung Galaxy S10 special 10th-anniversary edition a 5G phone with this Qualcomm Snapdragon 855SoC and 12GB RAM and the phone is likely to sport a 6.7-inch display.